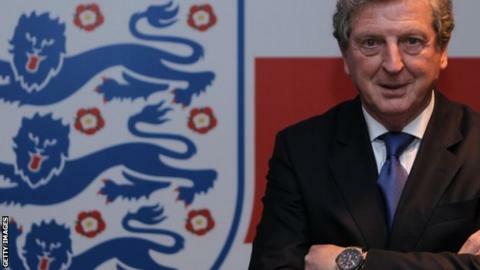 England manager Roy Hodgson has said his side will not play with fear during this summer's World Cup in Brazil. They play Italy in their opening Group D game on June 14, followed by matches against Uruguay and Costa Rica. Hodgson, who has been criticised for his conservative tactics, said: "We will be brave, we will believe in ourselves and we will risk defeat. "We have to allow our players to express themselves in the same way they do in the top Premier League teams." England lost on penalties to Italy the last time they met in a major tournament, at Euro 2012, after the game finished goalless over 120 minutes. Hodgson told Talksport: "We won't try and sneak our way through the games because I think with the type of players we have that wouldn't suit us. "I don't think you will see England sit back against Italy." Former England striker Gary Lineker described Hodgson's tactics as a "step back to the dark ages" after the 1-1 friendly draw against the Republic of Ireland last summer. England came through their qualifying campaign unbeaten, although they were held to draws by Poland, Montenegro and Ukraine. In November, they lost friendlies to Chile - when Hodgson gave debuts to Southampton's Adam Lallana and Jay Rodriguez - and Germany. Hodgson used the friendly win over Denmark in March to hand Southampton teenager Luke Shaw his first cap. Hodgson added: "The introduction of many of the younger players has given us an injection of pace and has given us the injection of good technical ability." England name their 23-man World Cup squad on 13 May.